These unique, often unconventional artists have proven to have a powerful impact. It is gratifying to watch their career trajectories after receiving the Herb Alpert Award in the Arts. 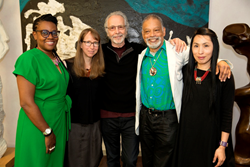 The Herb Alpert Foundation and California Institute of the Arts (CalArts) awarded the 22nd annual Herb Alpert Award in the Arts (HAAIA) to five exceptional mid–career artists at a lunch hosted by Herb Alpert, Lani Hall, the Herb Alpert Foundation and CalArts in Santa Monica today, May 6th. LA Times Arts & Culture article by Carolina A. Miranda. Huffington Post Blog “Stimulating Art at the Herb Alpert Foundation” by Tom Teicholz. The awards recognize the past performance and future promise of artists working in Dance, Film/Video, Music, Theatre and Visual Arts; an outstanding candidate in each genre receives an unrestricted prize of $75,000. To celebrate the 22 years of the Herb Alpert Award in the Arts, the Herb Alpert Foundation commissioned an extraordinary short film about the prize and the people it has touched. “This year’s winners have their ears tuned as much to the roiling culture as to inner imperatives. They are artists who provoke, uncover, celebrate, and engage,” says Irene Borger, Director of the Herb Alpert Award in the Arts. She describes why they were chosen. Ishmael Houston-Jones, for the fierce, raw originality and progression of his visceral, kinesthetic work, the ways he grapples with tenderness and loss, and for the not-easy practice of living without a safety net and staying the course. Cauleen Smith, for her unique, visionary voice, poetic imprint on the medium, mastery of craft, ethics, and sustained practice of risk-taking. Dohee Lee, for her commitment to creativity and experimentation, her ability to give new life to ancient forms, create new environments — and new audiences — and her powerful, transformative vision. Anne Washburn, for her fearlessness, brilliance, wild imagination, originality, theatrical ambition, and for surprising audiences throughout her career with each new play. Simone Leigh, for her rich field of inquiry, willingness to move forward into the unknown, spirit of adventure and collaboration; in short, for her urgent, necessary work.